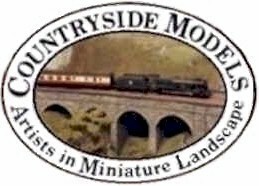 Countryside Models; professional model railway designers, makers and builders. but when we started in 1979 we were unique! deWe are . . .rs. & we can build your Model Railway for you! ! ! indent If you want to see the main web site you have just missed the link! Just click on the text or logo above. The rest of this page is an attempt to conform to changes in the way search engines find this site. Put simply, people looking for my services might use four or five additions to the words "model railways" or "railway modeller" to find me; prefixes such as "professional" and "scale" or suffixes like "builder", "maker", "designer" or "manufacturer". Since there are many ways of combining these words and since leading SEO practitioners suggest such repetition will be treated as "spam" unless the phrases can also be found in "the body" of the text, I have repeasted most of these "tags" below. Since such repeptition tells you nothing and makes for boring reading I suggest you ignore the rest of this page and click on the logo above which will take you to the main body of the site, the photo gallery, and info about us etc. etc. Enjoy! indentAs model railway makers, countryside models are good! (Just see our gallery of completed models if you doubt that!) COUNTRYSIDE MODELS are looked for under such names as model railway, model railways, model railway layout, model railway layouts, scenic models, scenic model railways, scenic railway layouts, scenic model trains, posh train sets, model scenery, finescale model railways, finescale layouts, loft layouts, model railway builder, model railway builder, layout builder, professional model railway builder, COUNTRYSIDE MODELS, countryside models, model railway makers, professional model railway designers, professional model railway manufacturers, railway diorama, railway dioramas, railway diorama makers, professional railway builders, professional model railway builders, scale model railway builders, scale model railway constructors, photographs of model railways, professional, scale, model, railways, trains, railroad, pike, designers, builders, makers, constructors, N gauge, n-gauge, HO, H/O, OO, 00 gauge, O, O gauge, EM, EM gauge, scale4, P4, 7scale, 18.83mm gauge, standard gauge, narrow gauge, countrysidemodels, scale model railway designers, made to order, broad gauge, 7mm, 4mm, 2mm, countrysidemodels.co.uk; This is not to mention mis-spelt words such as proffessional model railway whatever, modle, reailways, modeling, modelers and other howlers. Others have a particular gauge in mind but they might call it N gauge, Ngauge, Ngage, 9mmgauge, 9mm gauge or 9milgage, for instance. Then there's HO, H/O, 00, OO, OO gauge or 00 gauge, O, 0, 0 gauge or 0gauge, 7scale, 7 scale, 7mm scale, 7mmscale and 7mil scale, not to mention O guage and O guage. Then there's EM, EM gauge, 18mm, 18mil, 18mm gauge etc, scale4, scale 4, P 4, P4, 18.83mm gauge, narrow gauge, standard gauge or broad gauge. They might also look for the words made to order, 2mm, 4mm, 7mm, countrysidemodels.co.uk and of course there must be thousands of other ways that I haven't mentioned of describing a chap who builds model railways for money! 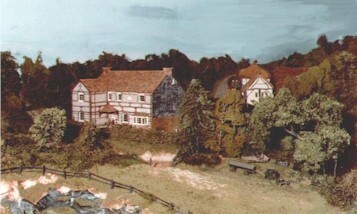 the model railway site where "seeing really is believing"! indentOwning a good model railway is a genuine delight for a surprising number of people. For those who do not have one however, simply looking at other people's model railways can be almost as much fun and, since most of our new visitors head straight for our Photo Gallery out of sheer curiosity, we have put it right at the beginning to make it easy for you! indentMost new visitors also have a lot of questions about "Who, What, Where, When and How" - not to mention "How much" ! You can find out whatever you want to know on our Home Pages. Besides all the usual info about who we are, what we do and what it costs to have us make a model railway for you, there is a lot of other, (sometimes surprising), information there for you too. Have fun! 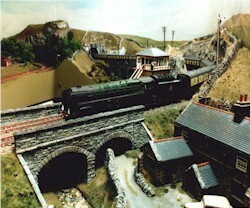 Part of Tupdale; a 00 gauge model railway which we completed in 2001. See "Gallery - Tupdale" (click photo above) for lots more photos with "in-depth" captions. Part of a Public Exhibition layout called "Steam Days", originally at Poole Aquarium, Poole Quay, Poole, Dorset. It was built by us in 1981. Techniques have improved since then but it remained an excellent advert for us until it was moved to Compton Acres where, it seems, it just faded away into oblivion... Shame! indentA useful corner of this website is our News Page where we feature news-type stuff which we'd like to share with you. Just click on the link above to open the page and then return here to continue! indentShould there be anything you want to know that we do not cover in the many pages here on offer you are welcome to e-mail us and we will be pleased to reply. However, if you would like us to quote you for a layout, please do take the trouble to fill out our questionnaire - if you don't, how can we know precisely what it is you want us to build for you and to what standard? indentWe hope you enjoy your browse around what we've been doing here at Countryside Models but do give yourself some time; there's a lot to look at! Last Updated Nov 2106. New news updates.